Hi, vegetarian carnivores! I am officially starting up getting out new recipes for you guys. After a much-needed break and a fabulous holiday it’s high time I come back and I am so happy to be back. Today’s recipe is one that is traditionally done for the holidays and is one that I made during the past season. 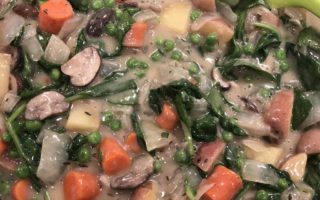 However, regardless of the time of year, it makes a wonderful comfort food that I know you can enjoy anytime it gets chilly outside. 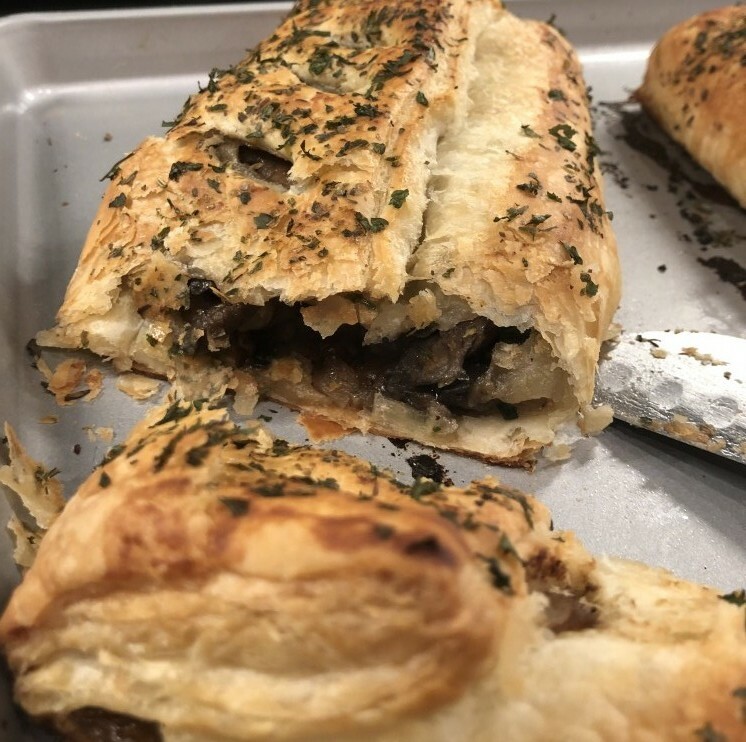 I have been seeing a great deal of vegan mushroom wellington recipes on the internet, as a substitute for beef wellington, and it got me excited to try it out for myself. 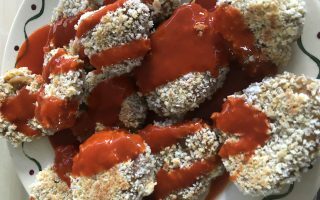 On top of a killer recipe, I’ve got a real bonus treat for all of you today: a vegan egg substitute for non baking recipes! Wellington is a traditionally English dish, made with a giant beef fillet wrapped in a puff pastry and baked. But you’re not here for a history lesson. Let’s jump right into what we are going to be doing. 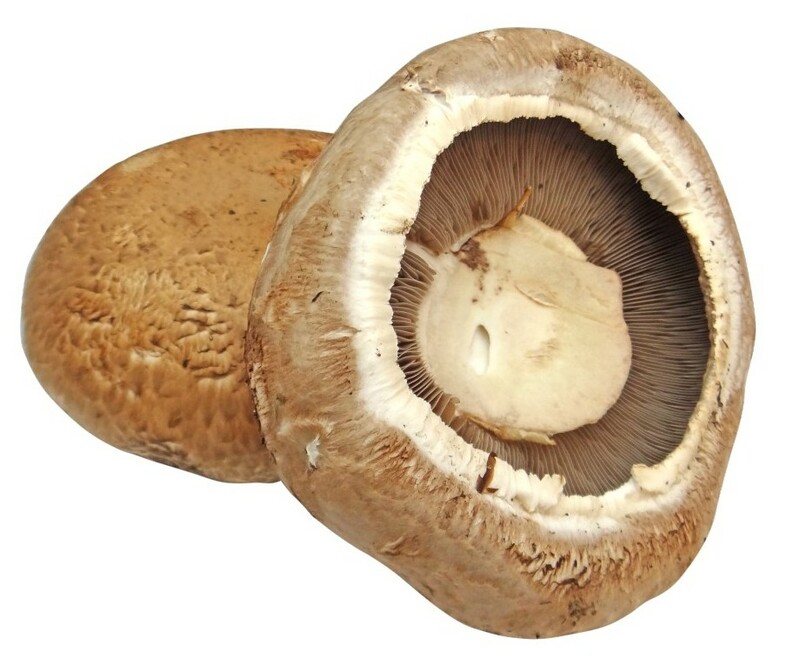 For our wellington we are going to be using portobello mushrooms. I like to buy giant whole ones and cut them myself. They have a great meaty texture, which is going to be great for our purposes. If you have ever had a portobello burger, you know that the caps make excellent patties. What we are going to be left with is this incredible texture difference between a soft and flaky crust against a meaty and rich flavored mushrooms inside. You guys are really going to love this one. 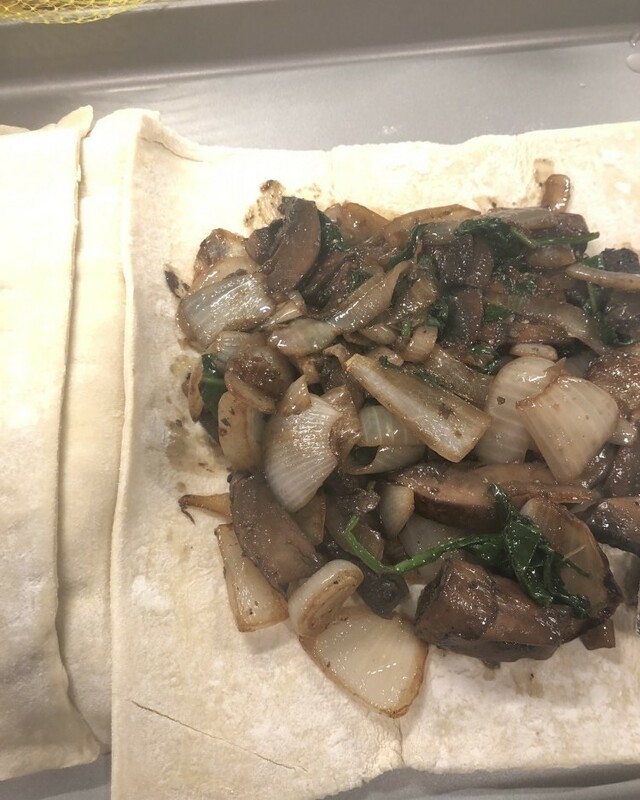 For the puff pastry, just make sure it is vegan. It is easier than it seems – I picked one up from Pepperidge Farms and looked at the ingredients and found no animal products on it and it was not even written that it was vegan. That is not to say that it was particularly healthy (it was not lol) or had no risk of being manufactured in a facility that may cause cross contamination. You may want to consider making your own puff pastry, though, because Pepperidge Farms does have some palm oil and high fructose corn syrup, albeit very little. I was in a pinch when I made this and was just grateful to find a vegan puff pastry immediately that I took it. From coconut oil, to avocados, to pumpkin puree, I have tried and tested it all, when it comes to egg and butter substitutes. Baking is different, however, and has different acceptability criteria. I cannot simply brush over avocado and pumpkin over my puff pastry and expect it to bake up, let alone taste good. This recipe was the first time I worked with aquafaba and it is incredibly easy and not fussy at all. The scaling on my ingredients comes out to 2 medium-sized wellingtons, based on commercially available puff pastries. Ok so let’s get started! Preheat oven to 390 degrees Fahrenheit. Heat oil in a saute pan over medium high heat and saute onions until they have reduced and browned. Transfer them to a bowl to prevent further cooking. Without adding any more oil, saute the portobello mushroom slices in the remaining oil. The liquid from the mushroom will seep out and give a base to cook them. 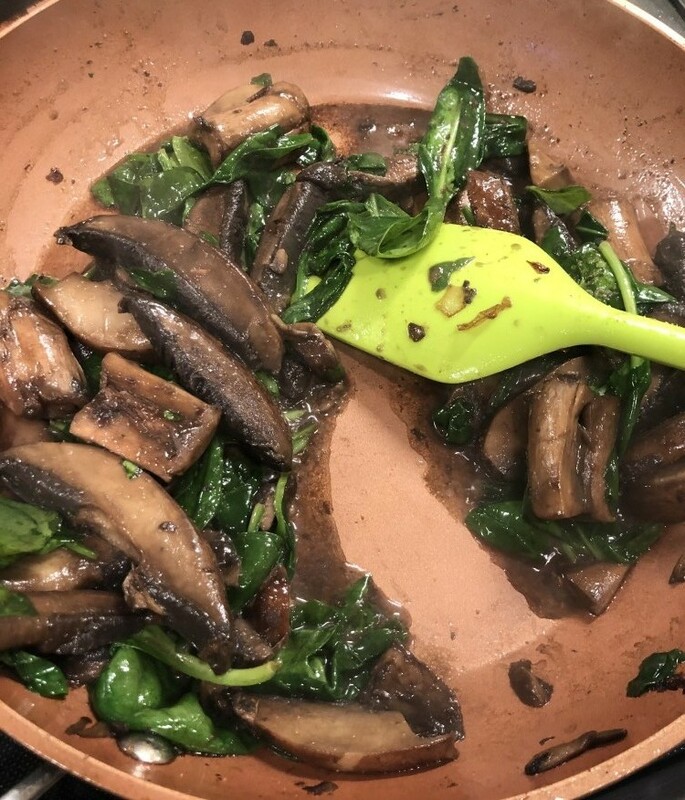 When your mushrooms have released liquid and are tender (put a fork through it to check) add in your spinach. Cook until spinach has wilted (around one minute). Transfer back your onions and give the mixture a good stir. Add salt to taste and a pinch of Italian seasoning. Divide the mixture in two and transfer equally to each puff pastry. 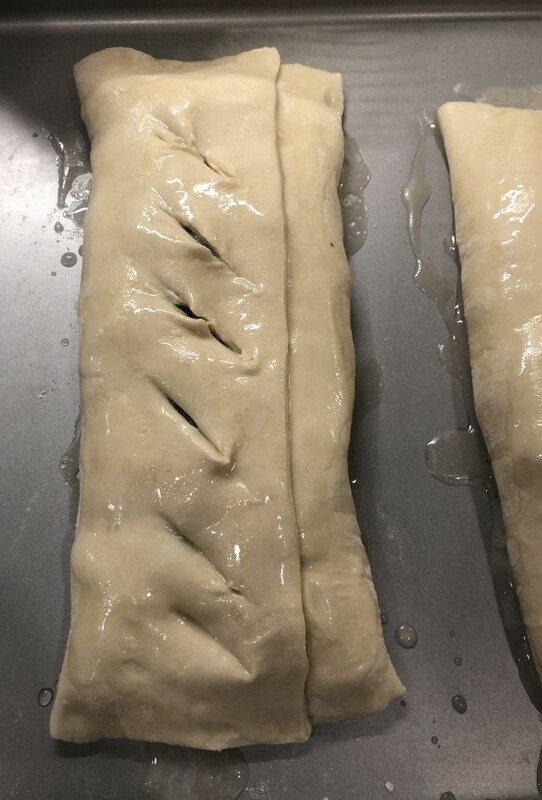 Carefully close the pastry and pinch the ends to seal them. This is important because it will prevent the juices from seeping out and making a mess in the oven. Create slits to vent and prevent an oven disaster. Mix the aquafaba, oil, plant milk, and maple syrup together and brush over the puff pastries. For artistic measure, sprinkle Italian seasoning on top of the puff pastries. Cut a slice and enjoy hot! I am officially impressed with aquafaba! 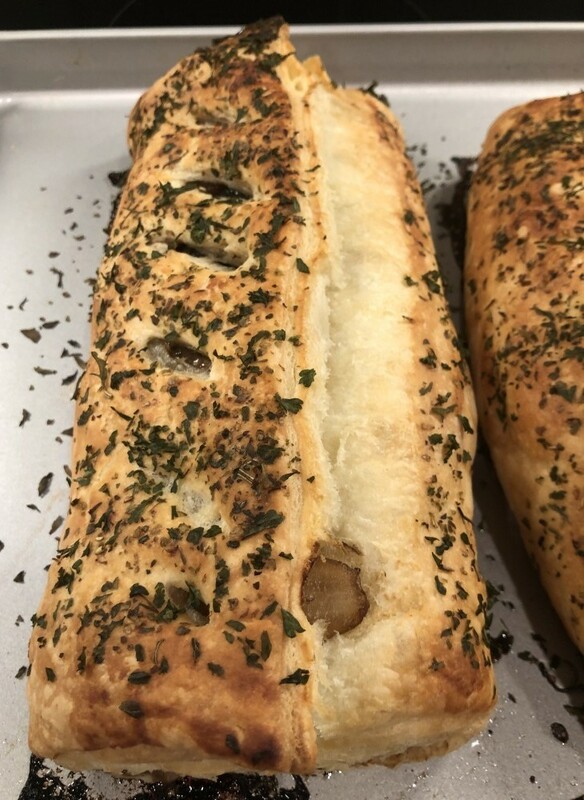 Not only did the wellington bake up (just look at that beautiful creation <3 ) but working with the miracle ingredient was painless. I will definitely be using aquafaba again as an egg substitute. What do you guys think? Leave me a comment below and let me know! 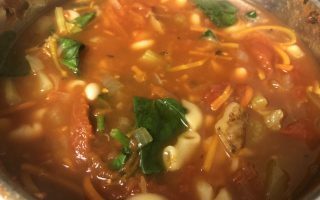 Instant Pot Minestrone Soup – Quick and Easy Dinner! It is always good to find recipes for a vegan dish. 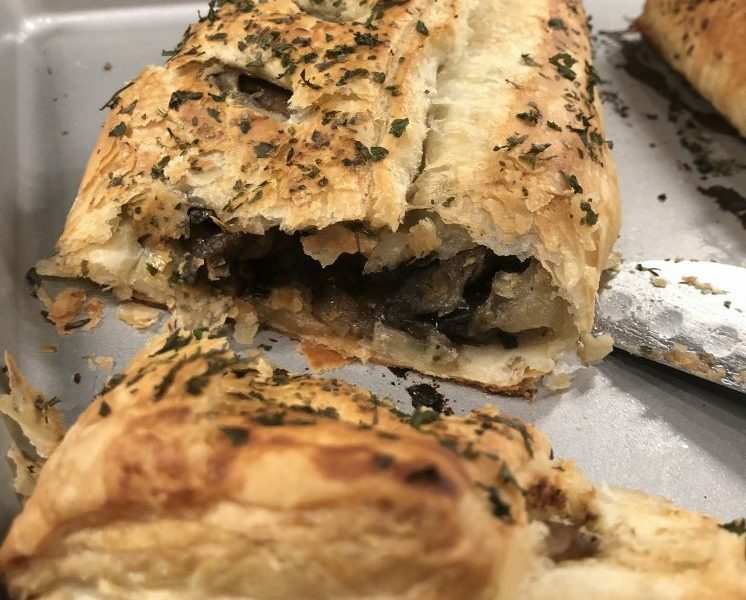 This Vegan Mushroom Wellington sounds really delicious. The ingredients are nothing complicated, I think it is really easy to find those ingredients in a regular super market. Looking at the instructions it doesn’t seem too hard to make it. I am definitely going to try this out. Hi! Thanks for your comment! Exactly- the ingredients are ordinary but the results are amazing! So excited for you to try this! 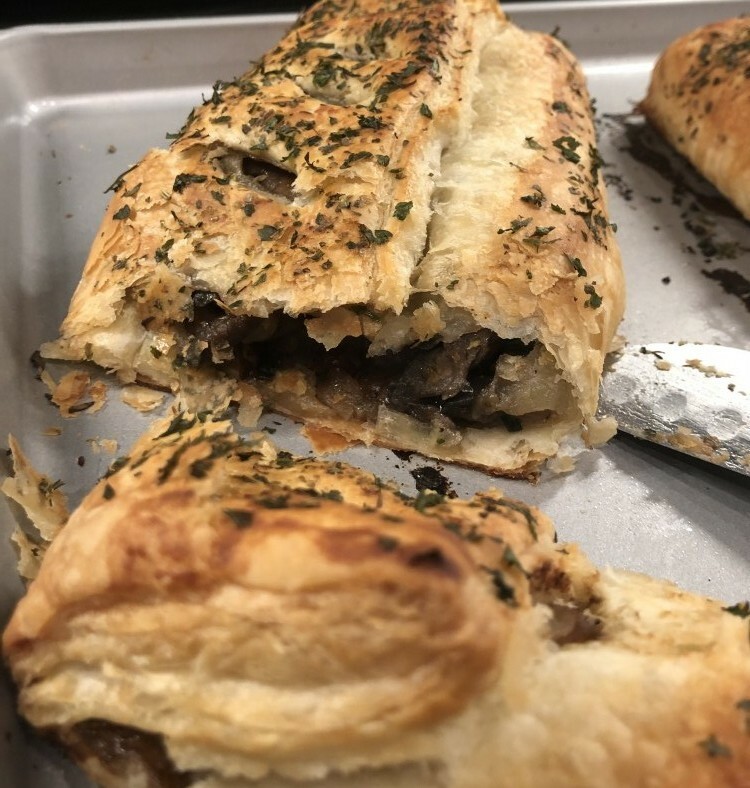 Thank you for sharing with us your ¨Vegan Mushroom Wellington – Winter Comfort Food¨. It really looks delicious, but I would like your opinion on a slight variation of ingredients.Baby spinach and dijon mustard. 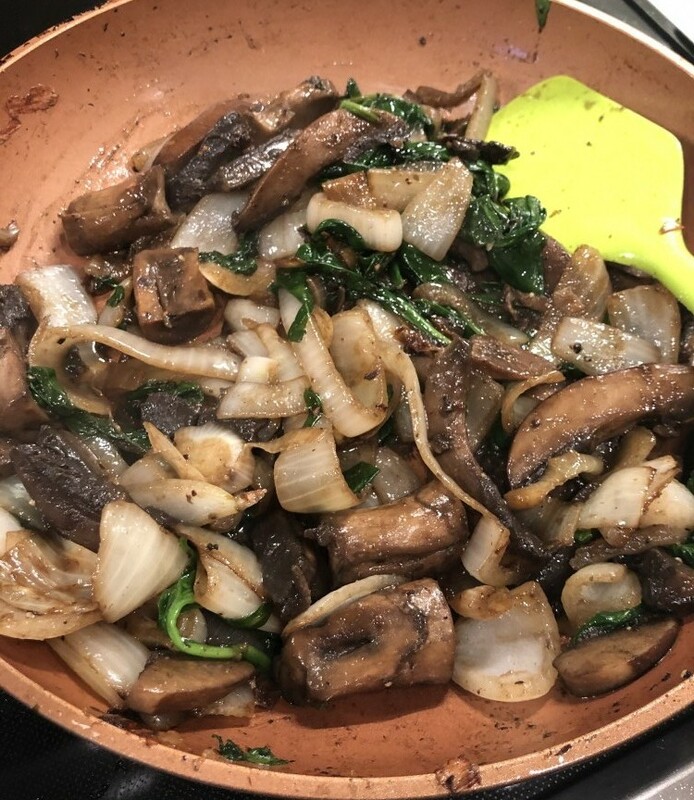 The mushroom are layered with cooked baby spinach (chard works well) and caramelized onions. A tip here, don´t use store bought caramelized onions, since they are too sweet. 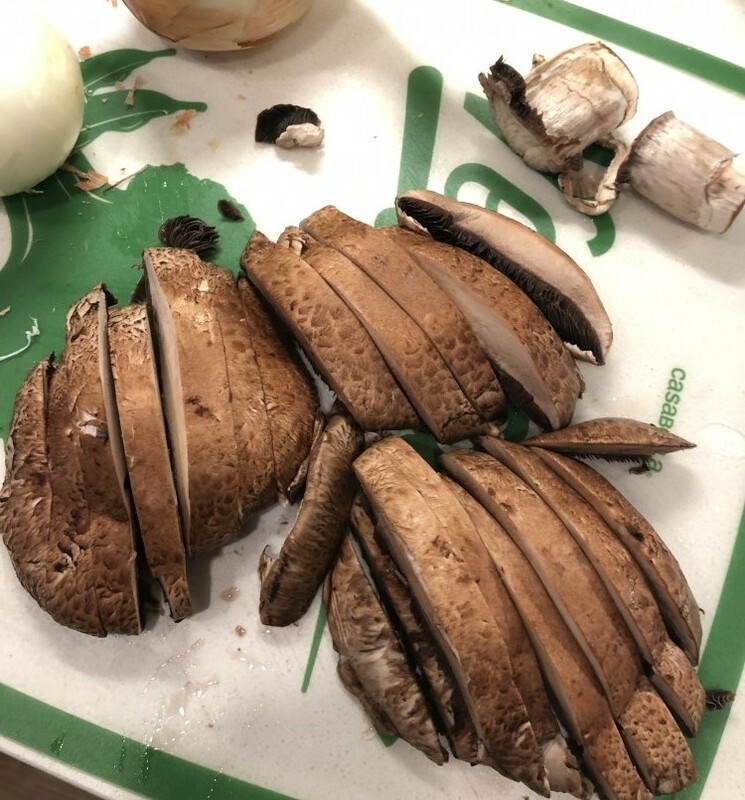 The dijon mustard will be spread over the mushroom and season with salt and pepper. The mushrooms will be placed on top of the spinach.Looking for the perfect side dish for the Mushroom Wellington? How about crispy roast potatoes. Golden, crunchy and spiked with herbs. Sounds great! I am a huge fan on dijon mustard! 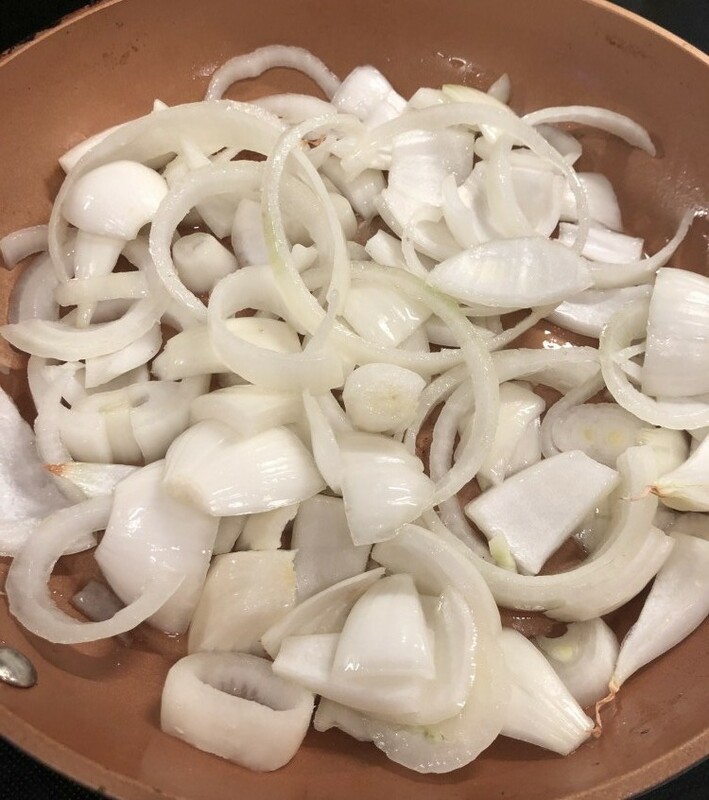 I also find that store bought caramelized onions are way too sweet for my liking… thank you for the tip!